Heat a large cast iron skillet to medium-medium high heat. Add chopped bacon and cook 10-15 minutes, stirring regularly, until crispy. Remove with a slotted spoon and place on a folded paper towel. Discard about half of the bacon fat. Place the skillet bacon on the heat and add the Brussels sprouts to the hot bacon fat. Cook 8-12 minutes, stirring only occasionally, until browned and crispy and desired doneness is reached, adding a little flavorless oil if pan becomes dry. Season to taste with salt, pepper and crushed red pepper flakes, if using. Heat a separate large non-stick skillet to medium heat. Coat with cooking spray or a pat of butter. Once hot, crack eggs into the skillet. Reduce heat to medium low. Cook 2-4 minutes, until white is cooked but yolk is runny. Place a lid on for the last minute to help the whites cook. Season with salt and pepper to taste. 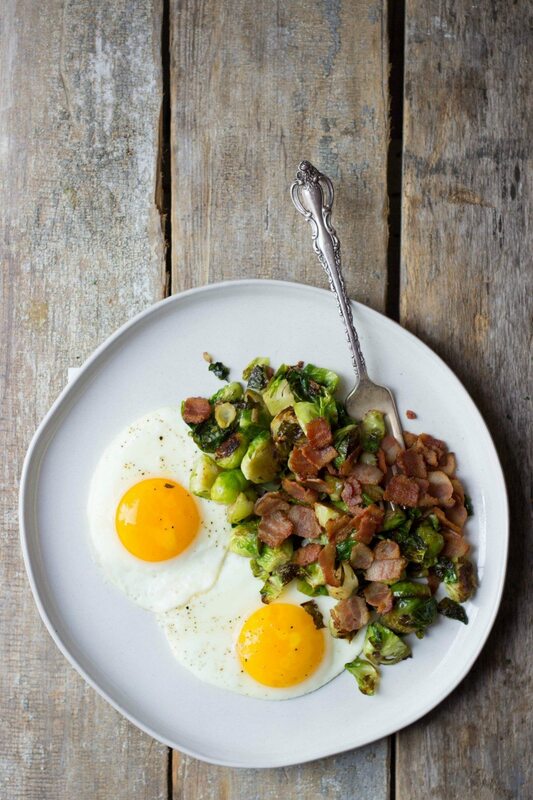 Serve bacon Brussels sprouts with fried eggs.